Here are some AA, RAC, Phone and Post boxes, hot off the press! I’m rather happy with them! The AA and RAC call boxes were requested by a TT Gauge model enthusiast who wanted them to go with the Police Box model I’ve made. I thought that a Post box and Phone Box (it’s a K9 phone box in case you were wondering) would make nice companion pieces. 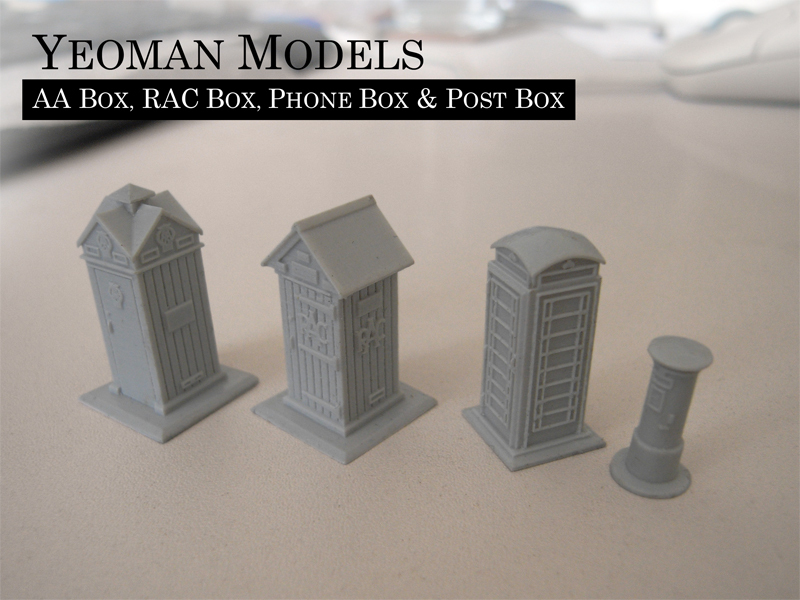 They are all 1:100 scale and the sizes range from the smallest Post Box (16mm) to the biggest AA Call Box (28mm). Not on eBay yet but they ‘ll probably go on next week. I’ll also be painting some of them up. Will blog about that when the time comes. ← I’ve put some new items on ebay today.